What goes on in the head of a futurist? Why is self-reflection so painful? This blog post is about a current struggle. It’s about integrity. It’s about time and energy. It’s about money. It’s about purpose. It started sometime last year when I showed some friends a model of change on a whiteboard in Melbourne. Since then I can’t get it out of my head. Basically it illustrates three roles that change makers can play based on the old s-curves. 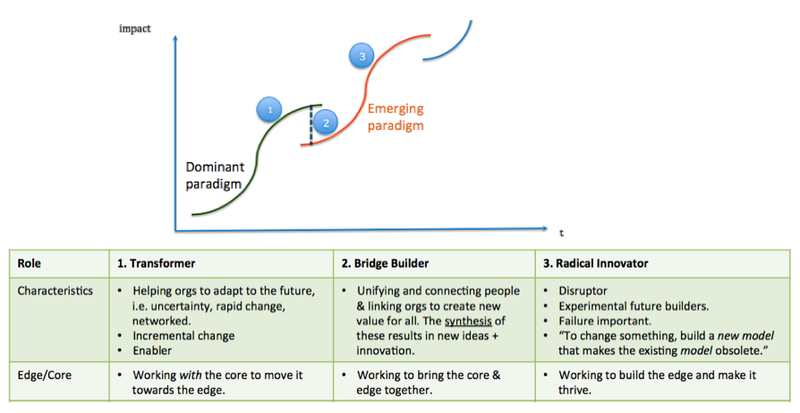 The transformer works with the dominant paradigm as an advisor, the bridge builder works with both the old and the new, while the radical innovator is focused on the emerging paradigm. The question I’ve asked myself since that day is: “In which role shall I spend my time and energy?” Some of my friends and mentors have suggested that this change model is a false construct; a real change maker plays all three roles. Like a trickster he can sneak in unnoticed anywhere in this image and act in many ways. I aspire to that, but I’m not there yet. Instead there’s currently an ongoing discussion in my mind between the transformer, the bridge builder and the radical innovator. The bridge builder now appears on the scene holding a book with a change model from The Berkana Institute. 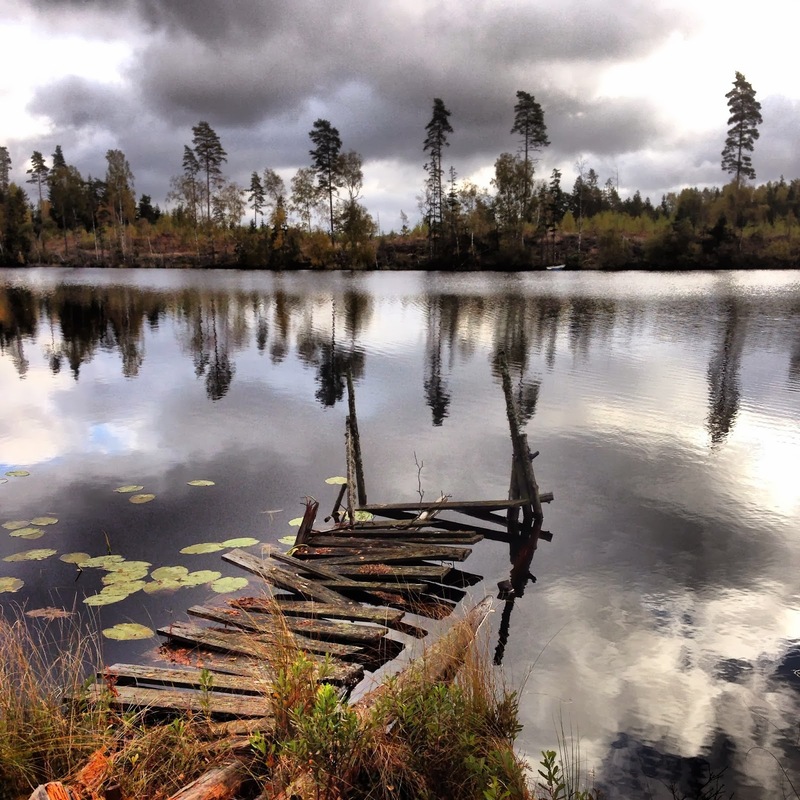 The radical innovator calms down a bit and objects: “But community building takes time. And we have no time to waste. We must act today! With disruptive innovation! The bridge builder quietly smiles and disappears into a contemplative state. The transformer has already gone back to perfect his pitch to a Fortune 500 client. The radical innovator continues to work on a start-up idea, which “will change the world”. This fight amongst my three inner change makers is an ongoing intellectual exercise. About moral philosophy. About practicalities and realities. But what do I feel? Where do I feel energy? I feel energy when I work with radical innovators, but the intellectual bickering between the three change makers halts me in my steps. Finance is also a hurdle here. But perhaps as more people shift to the new, the more potential there is to make a living here. And the more time and energy I spend to build the new rather than to give life support to the old, the healthier the new becomes, and the sooner the old dies. Hopefully I will integrate my three change makers into a coherent whole in the future. But today they are often blocking my actions. I have no solution for myself – rather more questions. Instead of asking myself which of the roles I will play, perhaps I should create a new model for change instead so I don’t have to choose sides? And I think we futurists have to know ourselves really well to make that choice. A version of this post appeared on the Association of Professional Futurist blog and an extended table of the change maker roles is found here.